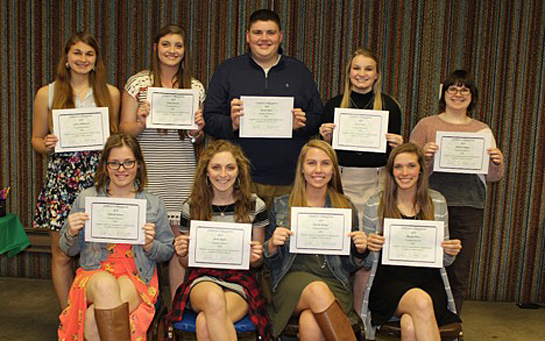 The 2019 4-H Senior and Volunteer Recognition Banquet was held Sunday, April 7. The banquet theme was “4-H is the Road to Success” and the Planning committee was comprised of Jill McCoy, Brenda DeLong, Shayna DeLong, Carrie Jellison-Garwood, and Lionel Enyart. The meal was catered by Shayna DeLong and Kim Grubaugh. 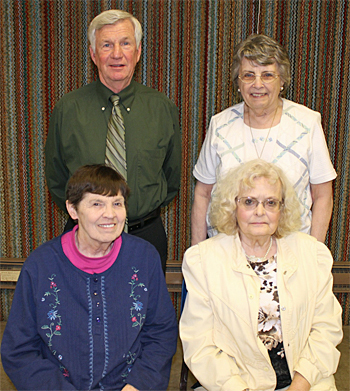 4-H volunteers were recognized for their years of service. Shown are (top row, from the left) Dennis McCoy (40 years) and Rita Adam (41 years; (bottom row) Judy Wortman (43 years) and Carrie Jellison-Garwood (53 years). Not pictured is Jay Gamble (15 years). Seniors presented their own unique reflections on their experiences as 4-H members. Betty Vorst, a member of the Venedocia Lads and Lassies, spoke of her experiences in 4-H with camp and Junior Fair showing her animals and the friends she had made throughout the years. Hannah Kraner of the Ohio City Blue Ribbon Workers spoke of her 4-H projects, experiences, and blessings throughout her time as a 4-H member. 4-H alumni Ericka Priest was the invited speaker for the evening, and gave advice to the Class of 2019. She talked about the opportunities she experienced through 4-H, her gains, and the long-lasting friendships she values today. Priest is currently employed as the ag teacher and FFA advisor at Crestview High School. Volunteers and parents help make 4-H possible. Without 4-H volunteers and parents the program would not have the mentors and leaders that 4-Hers need in order to learn the new skills that 4-H has to offer youth. With each volunteer comes knowledge, experiences, and skills which can be taught to 4-H youths and shared with the 4-H program “to make the best better.” Volunteers and parents are a major reason for 4-H’s success in youth development. Since 1902, parents and volunteers have helped the 4-H program develop successful leaders, build young minds, and set the path for 4-Hers to take the world by storm. Van Wert County is no exception. Active volunteers in the program range from months of experience to 53 years. Richard Jellison was a long-time volunteer in the Van Wert County 4-H program, and his love for the program, experience with youth, and kind-hearted nature made him an exceptional volunteer. To honor his life and show the spirit of this wonderful man, the Richard Jellison Advisor Award was created in 2012 following his death in 2011. 2019 seniors attending the banquet were (front row, from the left) Hannah Kraner, Sierra Shaffer, Kassidy Klinger, and Reagan Priest; (back row) Caton Williamson, Carly Wendel, Austin Sheets, Betty Vorst, and Jennifer Haggis. The 2019 Richard Jellison Advisor award was presented to the Bunny Hoppers’ Chris Heizman. Helping youths learn about rabbits as a 4-H project from selection, to feeding, health, and showmanship are just a few of the things that Heizman has taught throughout the years to his club members. He has been a valued volunteer with the Van Wert County 4-H program for 32 years. The banquet committee thanked Deb Knapke for her help with the program and senior slideshow prior to the event. Ag Credit donated cups and napkins for the event.